Hello Friends! It is a rainy cold day here in NorCal, more like a January day than a March day. The good thing about it is that it makes staying in and giving my craft room a thorough cleaning and purging much easier. I finished tackling all my paper and am really happy with what I was able to make myself do. I have about a 3 foot high stack of paper that I am offering to my scrapping buddies. What they don't take, I'll bring to work and give to my colleagues with young children. No more storing it here. Today's card was made yesterday and uses Freshly Made Sketch #26. A very cool sketch! Congrats on the purging in your scrapbook room...I am sure I would have soo much more space if I would so the same! Love your color scheme. Thanks for playing with us at Freshly Made Sketches. Beautiful sympathy card, the colors are calm and soothing. Thanks for sharing with us at Freshly Made Sketches! What a beautiful card ... The colour scheme is pretty and I love your clean styling! Thanks for joining us at Freshly Made Sketches !! Oh man I wish I lived closer to you Linda you have such an eye for paper! Would love to have your cast offs!! Your card is beautiful! 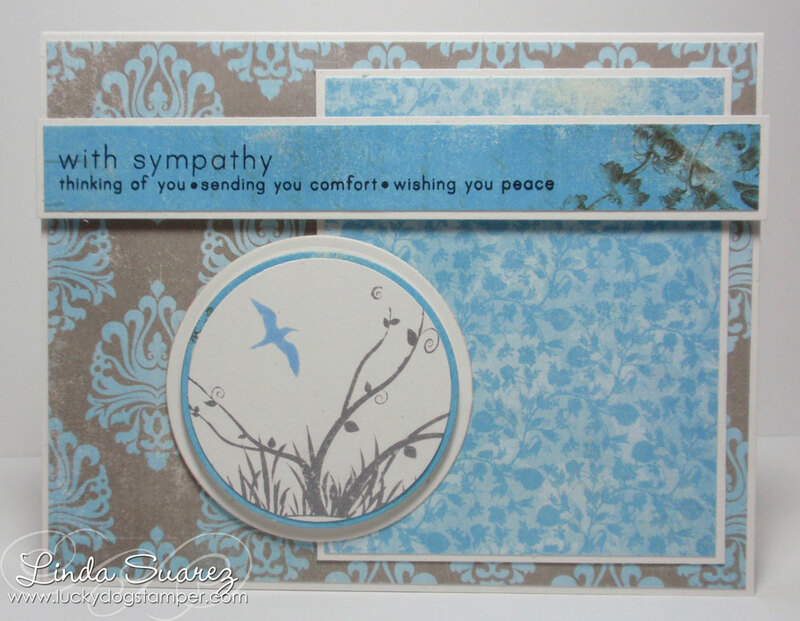 I love the grays and blues you used! !